Anyone who has driven the Kennedy Expressway has seen it: the massive white dome, festooned with angels, atop an enormous red brick church. 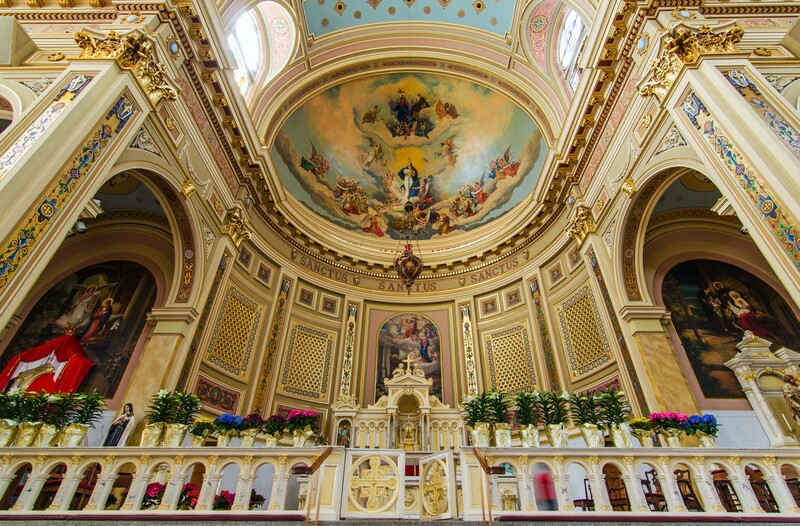 St. Mary of the Angels stands out as the grandest of the “Polish cathedrals” on the northwest side—and its history tracks pivotal moments in the life of Chicago’s Polish community. 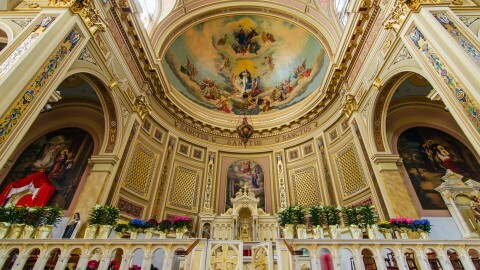 St. Stanislaus Kostka was established in 1867 as the first Polish Catholic parish in Chicago. 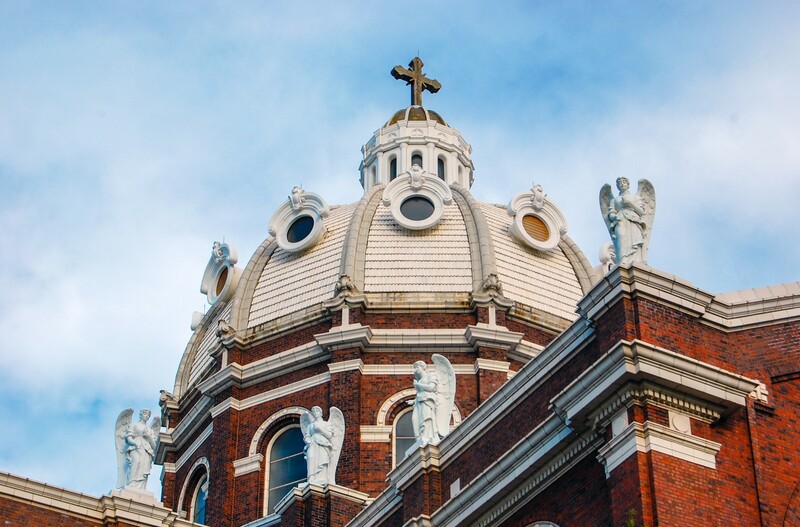 As the “mother church” for the rapidly-growing Polish immigrant community, it at one point served some 60,000 parishioners. Such constant overcrowding led to the formation of dozens of new parishes nearby. So it was when St. Mary of the Angels was founded in 1899. 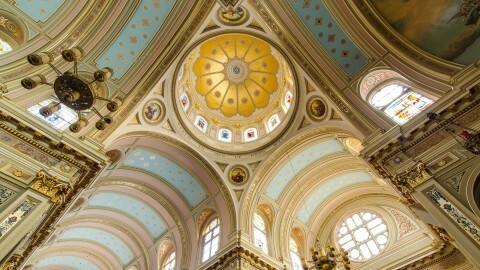 There are 26 angels positioned around the dome of the church. 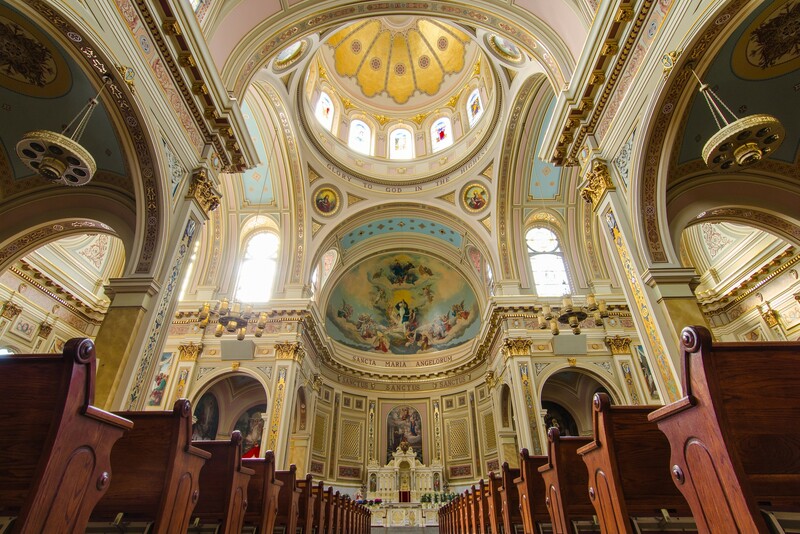 At its height, St. Mary of the Angels counted 20,000 parishioners. The height from the floor of the nave to the ceiling of the dome is 125 feet. The nascent congregation purchased two city blocks, subdividing one for construction funds. The current school building was quickly built with temporary worship space. Then attention turned to putting up a permanent building. 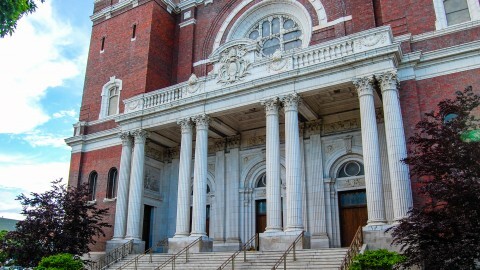 In the time-honored Polish tradition of hiring the best architects without regard to national origin, a firm with German-Austrian roots was chosen to design the church in 1911. Worthmann & Steinbach produced a plan that referenced one of Poland’s best-known monasteries, replete with Baroque ornament and other features borrowed from recognizable Polish landmarks. In an archdiocese dominated by the Irish, it was to be a bold statement on behalf of the growing Polish community. Walking into St. Mary of the Angels is a powerful experience. 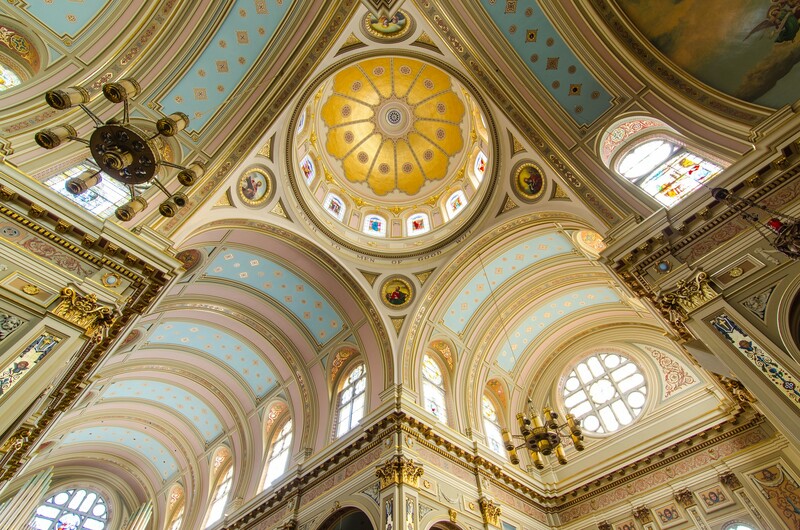 Your eye is immediately drawn to the light spilling from the giant central dome and a nave filled with colorful murals, golden yellow columns, blue ceilings and rose-colored trim. 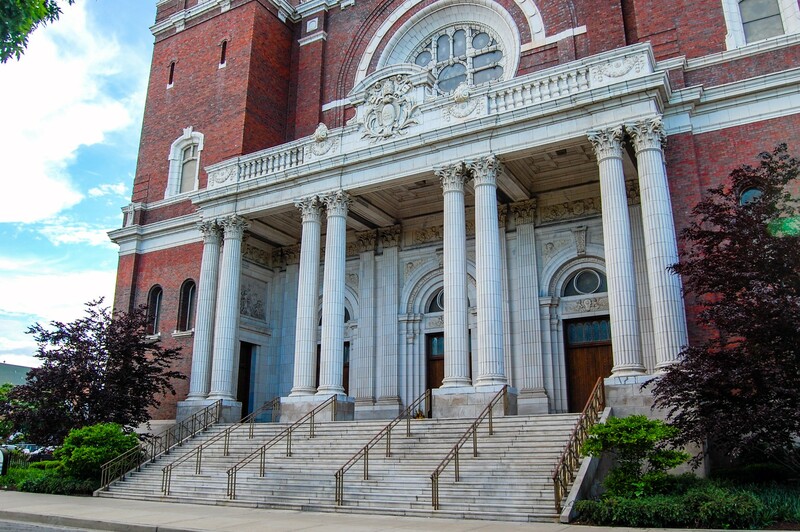 I can only imagine what it must have felt like for the tens of thousands of Chicago’s Polish immigrants who called this congregation home in the early 20th century. The detailed ornamentation must have stirred up memories of the Renaissance architecture they left behind in the homeland. Unfortunately, World War I broke out before construction began. Resources were not available to begin construction until the war ended in 1918. By then, much had changed. Emphasis was placed on the Americanization of immigrants from the various warring European nations. 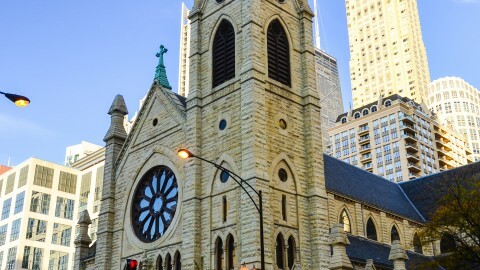 Chicago’s new Archbishop, Cardinal George Mundelein, was against the creation of ethnically-based “national parishes,” and sought instead to build one united Catholic church. And the Polish immigrants, once emissaries of a culture threatened with extinction, could now claim a brand new home country of their very own. 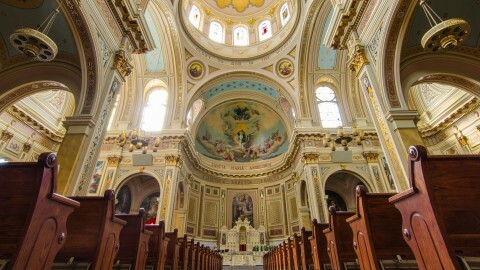 The church, as completed in 1920, lost many of the Baroque and distinctively Polish touches once envisioned. Its simpler design instead resembles St. Peter’s Basilica in Rome, a masterpiece of Italian Renaissance architecture. The immense nave is lavishly decorated, with accents of blue, rose and gold. Membership peaked at 20,000 in the 1920s, and declined as the Polish immigrants assimilated and moved towards the suburbs. The construction of the Kennedy Expressway in the late 1950s displaced many more. The decline continued for several decades until, beset by hazardous maintenance problems, the church was closed and slated for demolition in 1988. 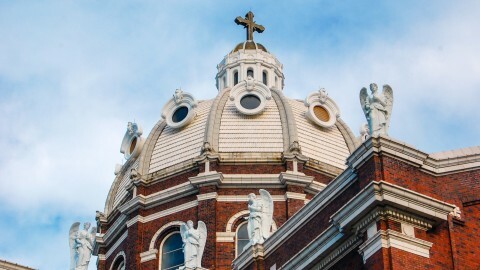 A vigorous campaign to save the building staved off destruction for several years, and convinced the Archdiocese to find another solution. In 1991, control of the church was turned over to the Society of the Holy Cross, a priestly order closely linked with Opus Dei. In the years since, fueled in part by accelerating revitalization of the surrounding area, nearly continuous work has been done to rehabilitate the building. Today, it serves a growing community, and is open to all who wish to enter every day.